(1) Click here to go to the Free Nook Reading Apps download page. If you’re not signed into your Barnes and Noble account, sign in now. The rest of these instructions assumes that you will select Windows PC under Computers, which will take you to the page shown in Figure 1. (2) Click the green Download Now button. A window will open for you to save the installation file to your computer. It will automatically set to save in the default folder for the browser you’re using. You can save it somewhere else if want. 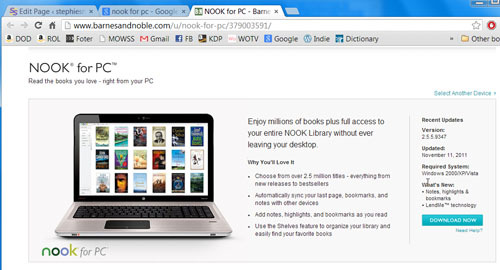 You won’t be using the file again after you’ve installed the PC for Nook application. (3) When the file has completed its download, you should see the file name at the bottom of the screen. Click on it to install. You’ll probably be asked if you want this application to make a change to your computer. Click Yes or Next or OK (whatever the appropriate choice is to continue). 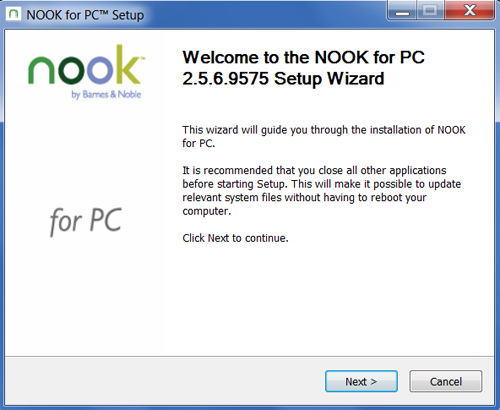 (4) The Welcome to the Nook for PC Setup Wizard window (Figure 2) should open. Click Next. Figure 2. The PC for Nook installation Wizard. (5) The Barnes and Noble agreement window will pop up. Check the I agree checkbox and click Next. (6) A window showing which components will be installed by default will open. Click Next. (7) The program will want to install in the default location. Unless you object (and there’s really no reason to put it somewhere else), click Next. (8) When the program has installed, click Finish. Nook for PC should open and if you signed into you Barnes and Noble account before downloading the file, any ebooks you’ve purchased through B&N should show up in your library.